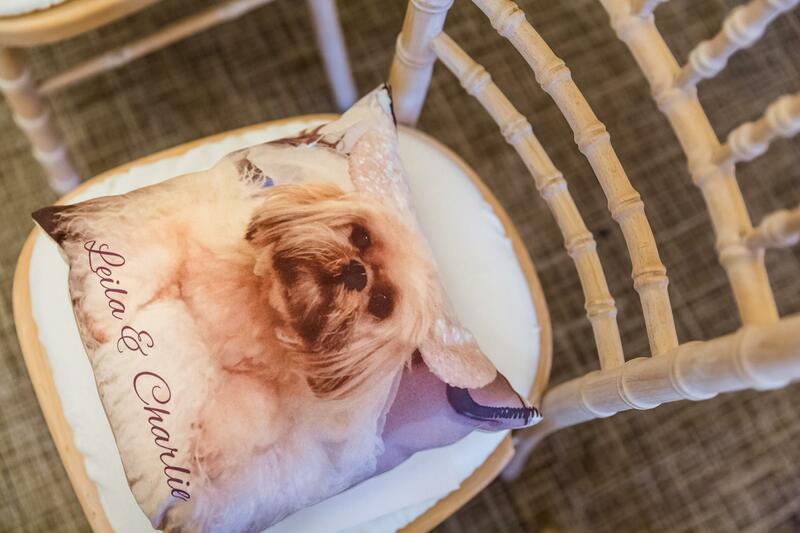 Everyone knows that your wedding is a time for friends and family, but for many people their furry friend is a member of the family! Your pet has been a valued part of your life as a couple. They make your house a home and will always be there for you. It’s no wonder that more and more couples are opting to feature their four-legged friends at their marriage so that it’s a real family affair. As a huge animal lover myself, I’ve written up the dos and don’ts of bringing your pet to the wedding. 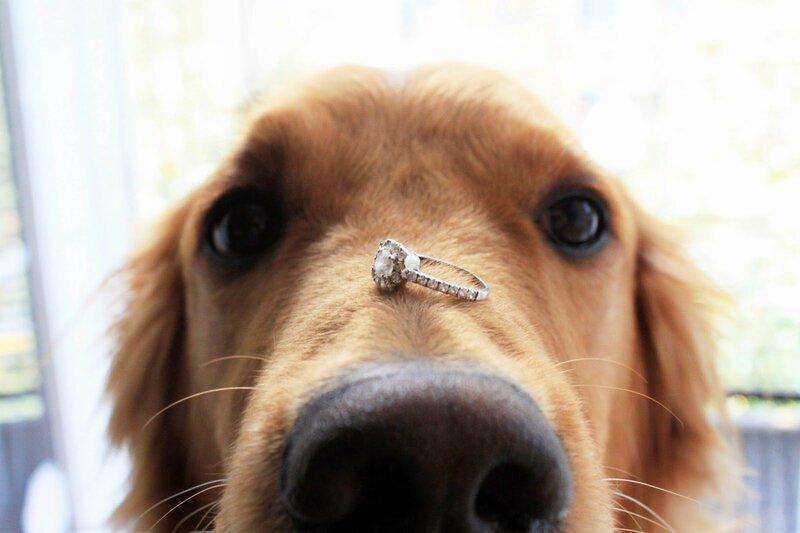 This should definitely be your top priority when considering taking your pet to the ceremony or even featuring in it. Some venues may only allow your pet on the premises if he or she is in a cage. Make sure that both you and your venue are comfortable with your plans. Your pet’s personality will be a central factor into how well they will cope with the business and pace of your wedding. There may be lots of children that want to play with them that may startle them or excite them too much. If your pet doesn’t like to be handled for too long or is very inquisitive and will struggle on a lead, take this into account too. You want everyone to be having the best time possible, including your pet. On the morning of your wedding, you’ll have a mad dash with the excitement of the day and your willingness to get ready and get started. With all the things you have to think about, you don’t want your pet cocking a leg on the signing table or covering your Maid of Honour in small droppings to also be playing on your mind. Pet Sitting Services, like Very Important Paws are noticing the importance of offering a wedding service and will make sure your pet is cared for and looked after throughout the day. They will pick them up in the morning and dress them with the corsage or clothing you chose for them, keep them fed, watered and happy throughout the ceremony, clean up after them if there are any little accidents and make sure that they are there with you on time for your photographs. Pet allergies are just as serious as food allergies and you wouldn’t write an invitation without asking for special dietary requirements, would you? This is why it is really important you either notify guests or ask if they have pet allergies just to be safe. You can then take precautions with your ceremony seating and be mindful of those guests going near your pet throughout the day. 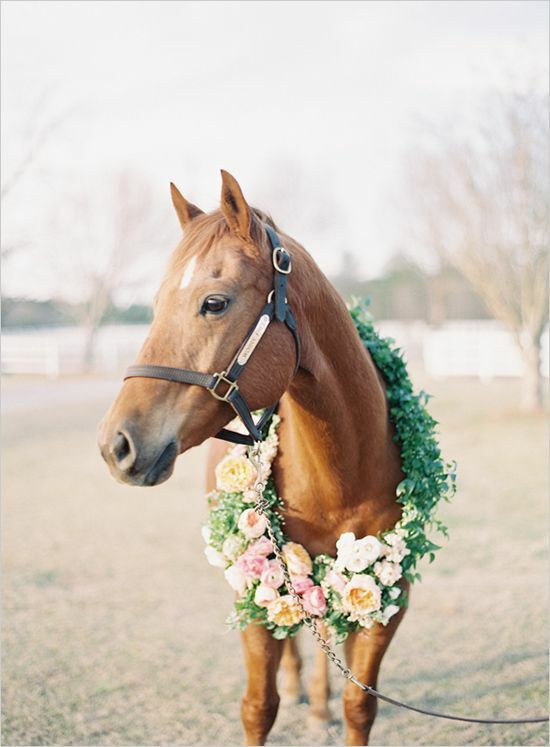 Horses are such lovely creatures and if you’re a seasoned rider I know how painful this may be to hear as it sounds so elegant to be riding your horse to the ceremony – ‘imagine the photos!’ However, it’s a definite no for me. If your horse can’t hold it in and you have a long train, you don’t want the risk of it ruining your dress. I hear it’s not terribly comfortable to ride side saddle either, which is what you’ll most likely have to do. Keep things simple for you and your horse by taking some nice huggy photos alongside them. No doubt you want to have your pet close to you on your big day because they are a valued member of your family and you want this joyous occasion to be shared by all… but let’s face it – the best thing about having them there are the absolutely, excruciatingly cute photos you’ll have in your wedding album, as you will see if you type ‘pets at weddings’ into Pinterest! Your photographer is your best friend in this regard and will need to know what they are dealing with. Give them plenty of warning so they can prepare. I know that your theme is the roaring 20’s with top hats and tails and you think it’ll be adorable to dress your pug in a little suit with a top hat and Dickie bow but please think about how he’s going to feel about this! If you’re having a summer wedding, his outfit, although adorable, will cause him to get very hot very quickly. Cats famously don’t like wearing outfits and good luck with getting Mr Rabbit in one! 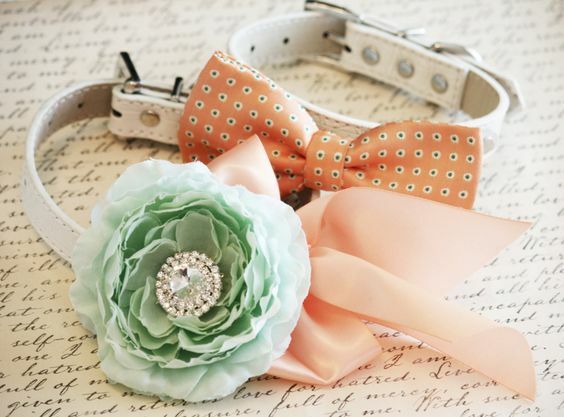 A nice floral collar or corsage made of flowers that are non-toxic to your pets will be all the dressing they need for spring and summer weddings. Conversely, if you have a pet, particularly dogs or horses, that could get a bit nippy at your autumn/winter wedding, consider getting them a jacket so they can stay warm and stylish. And that’s it! 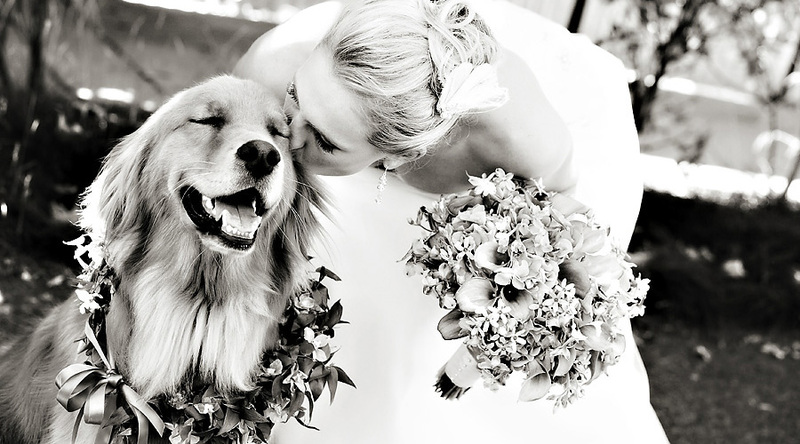 I hope you liked this blog on featuring your furry friend at your wedding. 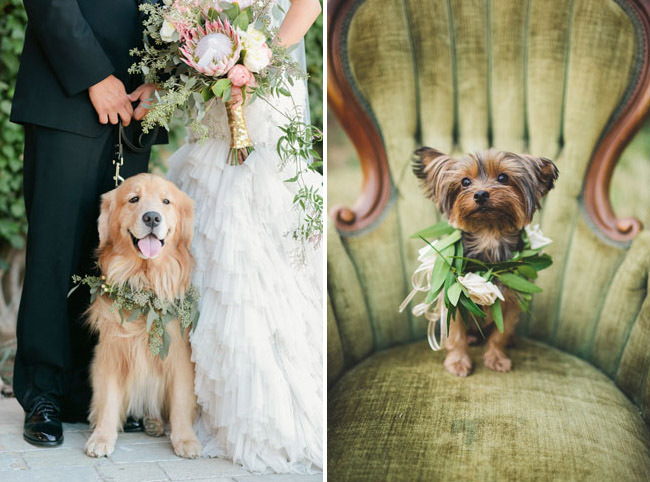 Would you consider bringing your pet to the wedding? Let us know on Facebook and Twitter!